Getting started with the Maestro Servo Controller For a full list of products shown in..
Getting started with the Maestro Servo Controller For a full list of products shown in this..
Getting started with the Maestro Servo Controller For a full list of products sh.. 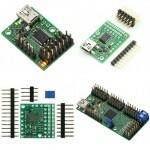 Note: Pololu has released second-generation Micro Maestro and Mini Maestro USB servo controller.. Note: Pololu has released the second-generation Mini Maestro 24 USB servo controller, which is ..
Wixel programmable USB wireless module, bottom view with US quart..